It's really starting to look like a barn now, but there's still a few details left to done. First, I added the top to the silo. The silo is officially done! 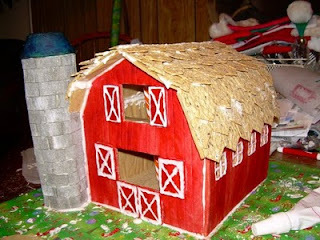 Next, the barn needs a little trim. 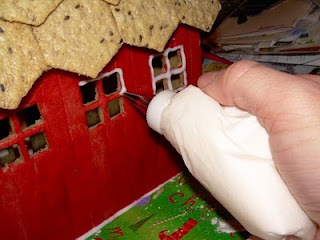 Here I'm adding the borders to the windows on the side of the barn. 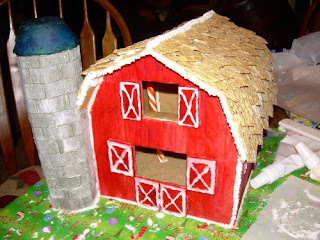 Here's the barn after adding borders to the barn doors and hayloft doors. At this point, I set the barn aside and started to work on animals. This, Fluffy, is the first of two cows! 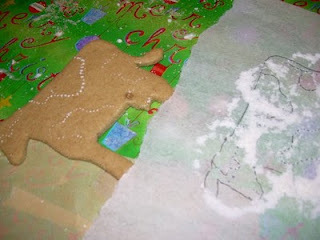 To get the spots right, I traced the image on tracing paper, poked holes with a pin outlining the different colored areas, put it over the gingerbread cow, sprinkled some flour on top, so it marked where on the cow all of the sections should be. Then it was back to making more animals. This time, the horses! 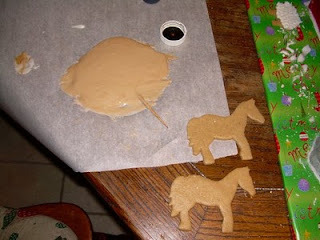 I chose a light brown color for them and mixed up a small bit of icing for them. 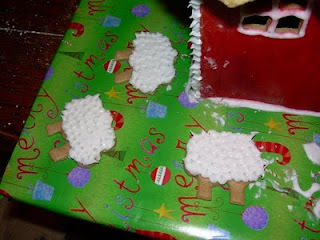 The book also had chickens, which I guess they considered too small for gingerbread. 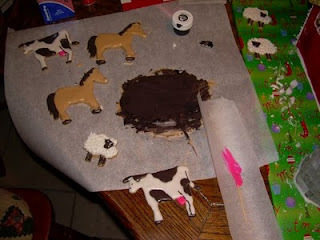 They suggested piping the icing directly onto parchment paper and waiting overnight for it to dry. And to make extras--in case some of them break later. Apparently, they are very fragile. I made a whopping 12 chickens, mostly because each one took all of about 10 seconds to make. 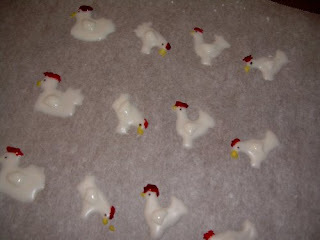 First I applied the white icing in the proper chicken shapes. After waiting a couple of hours for it to at least be partly dry, I added more icing on top to shape the wings, then added a red crown, yellow beak, and black eyes. The chickens are done, dude! And that concludes today's gingerbread session. COWS!!!! Thank you thank you thank you!!! They are ADORABLE!!! And such bright udders too!! Oh, and the barn and other animals are cool too. Are you going to double side the animals so they will stand up, or how are you going to make them stand on their own? I'm curious. Looks so cute with the white piping around everything on the barn. All really well done!Can't wait to see the finished product. Are you entering it in a local contest? Once again I wish I had the free time you have and the energy to do that... 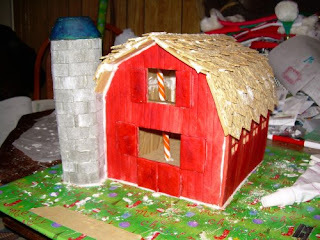 I would prefer to do that over the regular gingerbread house... I'm sure my kids would love it too. We made a gingerbread house out of a foam kit this year(I cheated I know less mess that way)!